Young Love will screen at the Pioneer Theater (aka Two Boots) for seven days starting August 22nd. 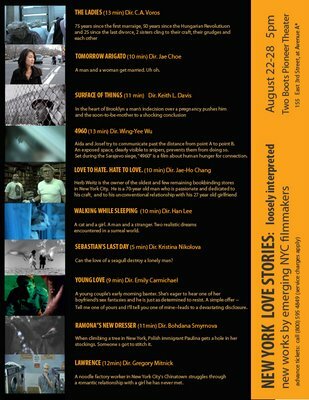 Sharing the bill are some other wonderful films, including some of the best acting I’ve ever seen by a feline (in Han Lee’s Waking While Sleeping.) You can get advance tickets at 1-800-595-4849.